Sometimes, making the home office child friendly means protecting the office from your child. While psychologists continue the debate over long term effects of video game violence, software cannot physically inflict pain on your children. Unsupervised children can inflict pain on your software by deleting applications or sensitive data. Maintaining a balance between child access to your PC and safety for your data is a must. Computers offer several easy software solutions for defending against child instigated data loss. For toddlers, a simple password will keep the screen safely locked if you need to leave the room. Be diligent and always lock the screen (or at the very least, set the screensaver to lock the screen after a few idle minutes). Even the best efforts to keep small hands from the keyboard don't always succeed. Having a password in place to keep data safe is cheap insurance for projects with hours of time invested. Older kids who want to play games or use computer learning tools still need some safety precautions in place, so you don't lose important work files. In this case, assign kids a very limited access Windows XP (or Mac OS X) user account. This lets your child know they are welcome at the computer, while also preventing accidents. Make sure your user account has a password, so they don't accidentally wind up logging in with more privileges. 1. 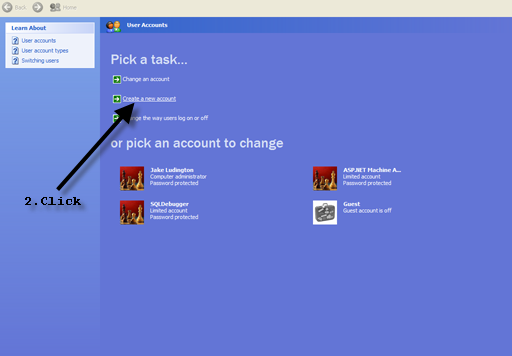 Open the User Accounts control panel by clicking Start/Control Panel, and then double clicking User Accounts. 2. 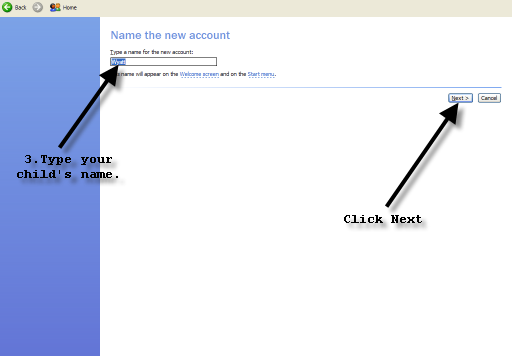 Click Create a new account. 3. Type your child's name in the new account name. 4. 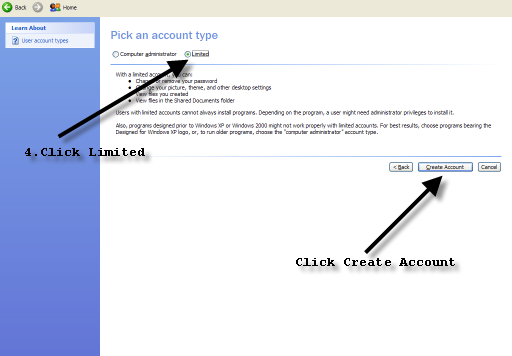 Choose Limited for the account type and click Create Account when you are finished (Computer Administrator is selected by default).